Gutenberg Press Ltd is proud to offer its clients the chance to be on the environment side. By being FSC&TRADE; certified, Gutenberg Press is able to print and distribute products, books, leaflets, magazines, maps, flyers, packaging boxes, etc, printed on paper and board that are sourced from sustainable and well managed forests or recycled material. FSC&TRADE;(Forest Stewardship Council™) is an independent, non-governmental, not-for-profit organization established to promote the responsible management of the world’s forests. FSC&TRADE; certification provides a credible link between responsible production and consumption of forest products, enabling consumers and businesses to make purchasing decisions that benefit people and the environment. What is FSC&TRADE; Certification and Chain-of-Custody? FSC&TRADE; certification is a voluntary, market-based tool that supports responsible forest management worldwide. FSC&TRADE; certified forest products are verified from the forest of origin through the supply chain. The FSC&TRADE; label ensures that the forest products used are from responsibly harvested and verified sources. FSC&TRADE; chain of custody (CoC) allows credible tracking of FSC&TRADE; material from the forest, through all successive stages of the production process, to committed retailers and consumers. CoC certification is for operations that manufacture, process or trade in timber or non-timber forest products such as paper and boards. CoC certification requires operations to identify the origin of raw materials used in FSC&TRADE; certified products and to keep FSC&TRADE; certified products separate from other products throughout the production process. Only operations with FSC&TRADE; CoC certificate are allowed to label products with the FSC&TRADE; trademarks. The FSC&TRADE; label provides the link between responsible production and consumption that enables the consumer to make socially and environmentally responsible purchasing decisions. How do you make sure it’s an FSC&TRADE; product? The supplier’s Invoice and Delivery Notes should also carry the FSC&TRADE; Claim, stating if the paper used is Mix Credit, 100% or FSC&TRADE; Recycled. The FSC&TRADE; CoC certificate holder is audited annually by an independent auditor to ensure that the FSC&TRADE; chain-of-custody is not broken and is maintained according to the current FSC&TRADE; standard. All suppliers who are not CoC certified cannot use the FSC&TRADE; logo on the products they manufacture. It is illegal for any supplier/manufacturer to make an FSC&TRADE; claim or use FSC logos without the possession of a valid FSC&TRADE; Chain-of-Custody certificate. The use of the FSC&TRADE; license or CoC code of another supplier by a supplier who is not himself part of the FSC&TRADE; Chain-of-Custody is also illegal. To ensure that the customer is getting a valid FSC&TRADE; product the customer should make sure that the product carries a valid FSC&TRADE; logo (with the FSC&TRADE; license number of the supplier who is manufacturing the product) and have the FSC&TRADE; Claim on both the invoice and Delivery Note. The FSC&TRADE; Claim should be accompanied by the supplier’s CoC code, such as Gutenberg's TT-CoC-002424. Only Suppliers who are accredited with the FSC&TRADE; Chain-of-Custody can make an FSC&TRADE; Claim. Even if the material has originated from an FSC&TRADE; source (supplier / merchant) it cannot be Claimed as FSC&TRADE; by a supplier who is not part of the FSC&TRADE; chain. More information about FSC&TRADE; can be obtained from www.fsc.org. 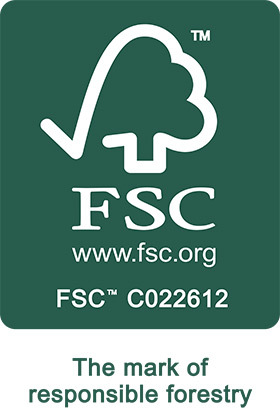 Should the customer need to check whether a company is FSC&TRADE;-certified or not, one has to access the FSC&TRADE; website (www.fsc-info.org) and use the search facility provided. Clients wishing any further information on FSC&TRADE; may contact Gutenberg Press’ FSC&TRADE;-representative at bagius@gutenberg.com.mt. You can access the Gutenberg FSC&TRADE; chain of custody certificate [TT-CoC-002424] on http://info.fsc.org. FSC&TRADE; certification demonstrates a proactive and innovative attitude to the sourcing and promotion of sustainable paper products. It helps to attract business from the growing demand of procurement, and looking to minimize their environmental impacts.